Oy I am so tired this afternoon!? Oh yeah, a baby is growing in there… I had lots of energy this morning – walked to Body Pump and met up with Sara, who was able to come to daytime pump for the first time in weeks. Class was good. I was feeling good. Chest is going to hurt tomorrow! I came home and downed some OJ to tide me over until lunch was ready. Also had a few grapes to plump up the ole blood sugar. This lunch took a little bit of time to cook because I made hard-boiled eggs! But really this method works so well. 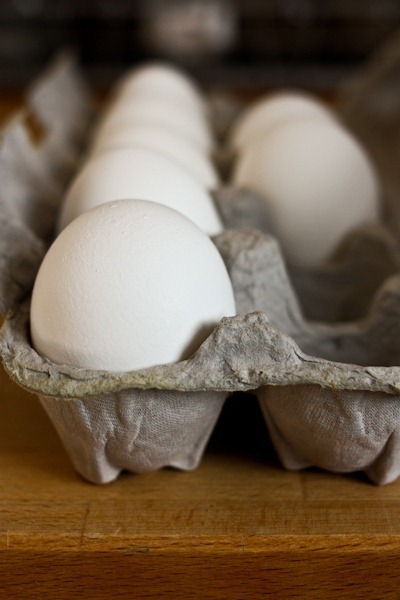 The cold shocks the eggs into pulling away from their shells and easier to peel. And because I could just feel the craving coming on…a Mason Jar cookie from my freezer for dessert. I already dozed off while working earlier this afternoon. I’m sipping hot peach oolong tea to try to wake myself back up! 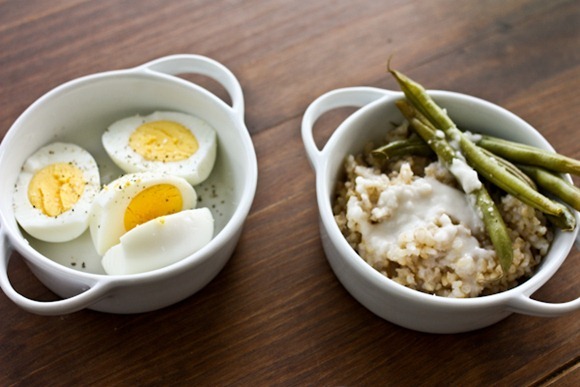 I tried that exact way to do hard-boiled eggs this weekend, and it DOES work like a charm! SO great. Looks delicious! That is one perfect looking lunch. My tofu “hard boiled” eggs don’t look so pretty! it really is a fool-proof way to hard boil eggs! I love hard boiled eggs, they are my favorite thing to eat on weekends! I love hard-boiled eggs. I especially like them warm, choppd up fine, eith a little milk, and ,of course, S&P. They are stillwarm after you shock them with the cold water, just peel before they sit very long. I make hard boiled eggs pretty much the same way! Well, haven’t tried the shower part.. I learned in culinary school a few weeks ago to put eggs (not too cold) into BOILING water and let them cook for exactly 12 minutes, this was followed by placing them in an ice bath. We learned it was the best method for consistency no matter how many eggs you make, whereas the bring to a boil method can cause inconsistency if you’re making a very large batch of them–but that’s really interesting! That must have been a fun lunch! i’ve heard that cold water trick – it does truly work! i love hard boiled eggs… i just had one in my salad today for lunch! it adds so much flavor, and the protein + fats help keep me satisfied. Peach oolong tea sounds delish! Esp when sipped while eating that amazing-looking cookie. Happy wknd! For being nauseous your eats are great! I totally know what you mean about feeling a craving coming on, it’s like why even try and ignore it. that rice with coconut butter on top looks so delicious! I use the same method for hard boiled eggs! Wow! Those are probably the most perfect eggs I’ve ever seen so you know I’ll be giving those a try! It must be catching because I’m super tired right now! Yeah he didn’t play it this Monday either. I think he thinks we are sick of it. Totally not!! I think you’re eating wonderfully! I hope you feel better and get an extra boost of energy!! I used to boil my hardboiled eggs vigorously for about 7 minutes and they would come out with the yolks all green….gross! That was until Julia enlightened me as well! I think it’s awesome that you are doing Body Pump while pregnant. I’m getting certified to teach it soon and would love to have a specific class for pregnant women with modifications. My friend Lynsie is still going at 35 weeks! Thanks so much on the hard-boiled egg cooking info. I’ve heard so many different methods from so many different people and websites and have yet to find the perfect one. This sounds like a good one and I hope it finally puts my hard-boiled egg question to rest. Thanks again! Now if I could only figure out how to peel them properly without them breaking into thousands of little pieces, I would be one happy puppy. Perhaps this cooking method will help with that too? It should, and peeling them under water helps too. Gah, I am so excited for the debut of BERF!! 🙂 That looks like a perfect technique for hard boiled eggs, I’ll have to try it out. You can talk to 10 people and get 10 different versions of how to hard boil an egg. This one makes as much sense as any of them. Thanks for sharing! I didn’t know you were in PR! Seems a lot of us bloggers were at some point 😀 Too cool that you met someone who actually learned cooking tips from Julia Child. That woman is practically my hero! 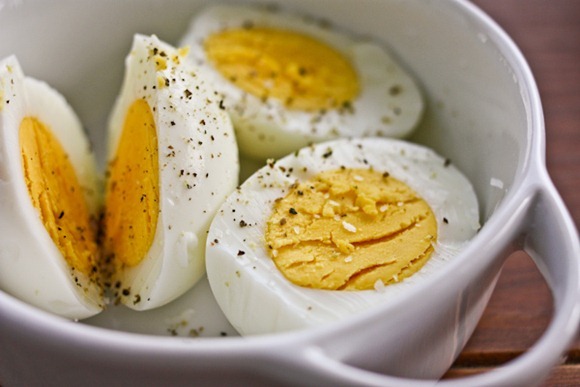 Thanks for sharing the recipe to perfect hard boiled eggs! That is very helpful, and I may make some tonight or tomorrow. Thanks for the egg technique! I don’t often eat hard boiled eggs, but I’ll try it out next time I do. That’s how I hard boil my eggs! I didn’t know JC herself came up with it. Very cool. I hear ya on the tired front, I felt that way yesterday, but every day is a new day and energy will come back! 🙂 She was very down-to-earth and also very tiny! she always commented about how “her kitchen counters were so [freakishly] short” hehe! Wow! I am away on work business for a few weeks and big things are happening in the KERF world! Just now catching up on the blogs and read about your wonderful baby news! Congrats to you, Matt and all of your family. Aaaah so THAT’s where the egg boiling comes from. I learned the same method from America’s Test Kitchen, but I am just sure now that they stole it from Julia! Except they let it sit for 10 minutes, not 13. The yolks are solidly done, but still bright and moist. Boiled eggs always remind me of picnic lunches! 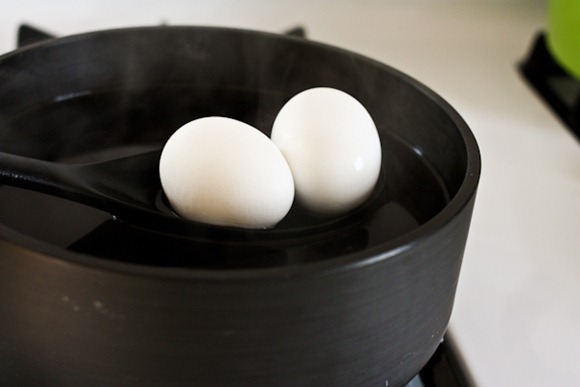 That is just how I boil my eggs, but for 7 minutes so as they are a bit runny insided…yummy! 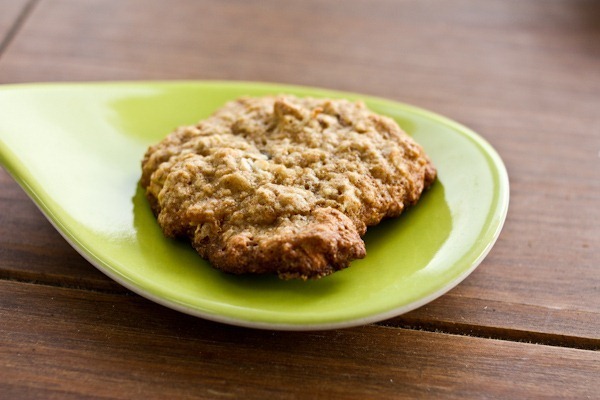 Your cookies almost looks like it is heart shaped! Valentine’s Day must be on the brain! What a perfect looking afternoon. Sorry you’re feeling such a lack of energy, I hope that it comes back to you soon! My sister definitely came through the groggy/tiredness feeling by the second trimester so I hope you do too! Hard Boiled Eggs got my through my First Trimester.. (i’m finally just now to my third!) Any time I felt sick I would eat one and almost instantly felt better.. Funny, I would never argue with Julia Child!, but my method also results in perfect hb eggs every time. 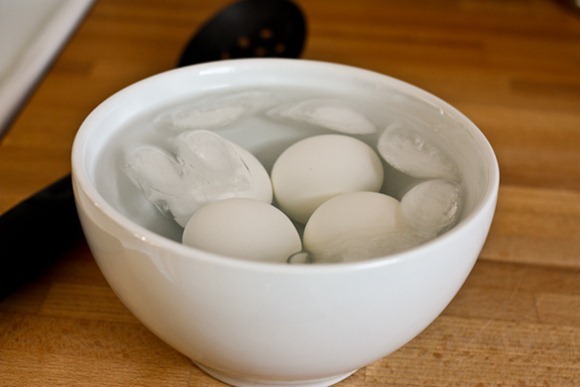 Take eggs out of fridge to warm or stick in a bowl and run a little warm water over (just so they aren’t cold from the fridge). Boil water. Lower eggs into boiling water, turn heat down and simmer 10 mins. Plunge into cold water. Never had it not be perfect. Rest while you can! It’s amazing though that all of a sudden you’ll have a ton of energy. Something about that first trimester makes you tired! 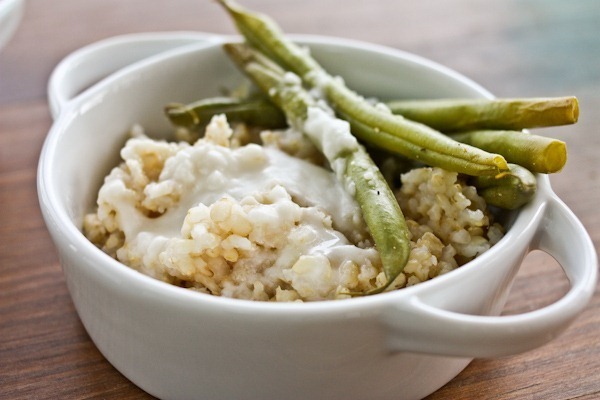 Love the coconut butter on the rice. I always wonder if I’m doing boiled eggs right. I swear I do something different every time. I will try this one next time. I make Julia’s scrambled eggs and will never do it differently from now on. They are perfect! That really is the ONLY way to do hard boiled eggs. I don’t think I could deal with the shells otherwise, hehe. Thanks for sharing that recipe. Mine always end up with green yolks so I think that they are overcooked. I’m definitely trying your recipe or Julia’s. 🙂 They looked SOOO delicious! I’m a long time reader and so excited to learn of your pregnancy, how wonderful!!! I definitely enjoy a good hard-boiled egg, yummy! Congrats! I just had my 2nd baby a few months ago and it definitely is a blessing! I have two awesome girls and wish you just as much joy as they have brought me. !!! Have you had them all kinds of other ways? They are so convenient! Hard boiled eggs other ways? …No. I’ll do eggs every other way though. I’ve never made hard-boiled eggs, but I LOVE them. Gonna have to give these a try. 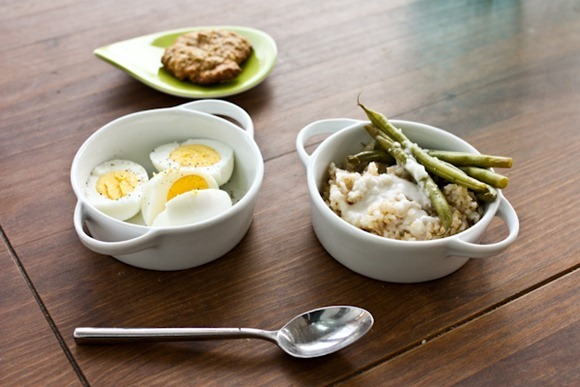 Finally now I will boil eggs and have them look as professional as yours, Great plating and photos on this post. Happy weekend! Hey, if veggies are grossing you out, could you do smoothies with fruits and vegetables? I often throw a handful of baby spinach in with frozen bananas, frozen berries, protein powder, almond milk (I’m allergic to “moo juice”) and sometimes I’ll take a jar of baby food vegetables, like carrots, green beans or squash and pour that into my smoothie with the other frozen fruits. You can’t really taste the veggies with the other stuff in there. I adore hard-boiled eggs (acquired taste gleaned from College!). Those are perfect looking beauties. Your lunch in general just looks divine. Love the idea of coconut butter on top! I was wondering how you are doing with the smell of coffee. I assume you are drinking little to none, but can you even stomach the smell? I looooove coffee but during early pregnancy the smell made me so nauseated. That and any kind of cooking meat, so gross to me . Uurrrrgggg, fresh in my mind like it was yesterday and it was 23 years ago. Coffee doesn’t bother me! I’ve had it a few times but don’t really make it at home anymore. Actually I smelled it last night at the theater and really wanted some! I do almost the same to hardboil eggs – I think I learned it from Martha Stewart, but maybe she learned from Julia 🙂 I love how it also makes the yolks perfectly yellow! Hi Kath, i just wanted to thank you. I suffered with anorexia for over a year and upon finding your website I felt reassured to gain weight becaus4 I knew I would become healthy and not “fat” Thank you so much, you seriously saved my life! those eggs look great — I LOVE eggs! Do you think that technique would work at high altitude? I make my hard-boiled eggs the exact same way!! Works brilliantly, and peeling is so much easier with older eggs vs. fresh. I love hard boiled eggs, also afternoon naps, but as a working women, no can do! Congratulations on your preganancy Kath! How do green monsters sit with you? Maybe you can use those as a way to get in your veggies! Wow, the texture and color on those yolks is amazing!! I used to bump into Julia when I was first married in Cambridge MA at the market. I was too starry eyed to speak. But she taught me (via Boston PBS) how to make an excellent omelet! Thanks for giving us her method for making hard boiled eggs. is that really the amount of juice you would pour and drink? Yeah. 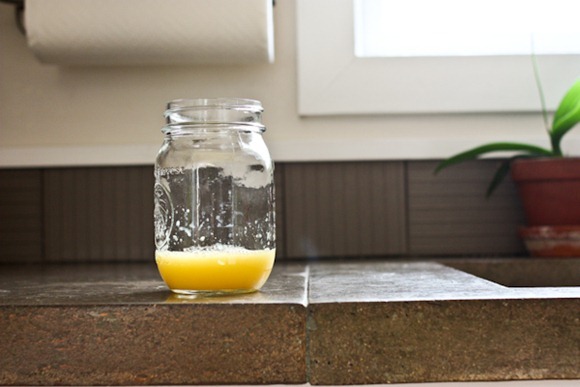 The jar is big and the juice is dense.